Joseph Randall Holzapple was born on 7 September 1914 in Peoria, IL. He was the son of Nathaniel A. and Annetta Ritchie Holzapple. 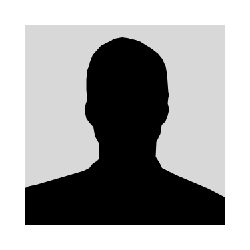 He was a 1932 graduate of Peoria High School and graduated from Bradley University in 1938 with a Bachelor of Science degree in Business Administration. He sold insurance prior to entering aviation cadet training. He entered aviation cadet training in December 1940 and graduated in August 1941 with a commission as a Second Lieutenant in the U.S. Army Air Forces, and his pilot wings. He then performed various flying duties at Jackson, MS; Patterson Field, OH; and Barksdale Field, LA. He was ordered to the European Theater of Operations in September 1942, where he served as Operations Officer and then Commander of the 319th Bombardment Group, Twelfth Air Force. He flew 91 combat missions in North Africa and Europe with a total of 390 combat hours; mostly in B-26 Marauder aircraft. In November 1944, the 319th Group converted to B-25 Mitchell aircraft and used them for approximately two months before the Group returned to the U.S. where it was re-equipped with A-26 Invaders. In May 1945, the Group moved to Okinawa where it operated until August 1945. During this period, Holzapple flew eight combat missions over Japan and mainland China; totaling 33 combat hours. Holzapple returned to the U.S. in February 1946 and was assigned to Headquarters Army Air Forces, Washington, DC, with duties in the Requirements Division of the Office of the Assistant Chief of Staff for Training and Requirements. He entered the Armed Forces Staff College in Norfolk, VA, in August 1949 and completed the Joint Operations Course there in January 1950. He returned to Washington and was assigned to Headquarters U.S. Air Force for duties with the Air Force Special Weapons Project. In September 1951 he was assigned to the Air Research and Development Command at Baltimore, MD, where he served first as the Deputy for Strategic air and later as Assistant for Operational Readiness. From August 1954 to August 1955, he attended the National War College in Washington. After graduation, Holzapple went to England to RAF Sculthorpe to become Commander of the 47th Bombardment Wing. In October 1956, he was assigned to U.S. Air Forces in Europe with headquarters at Wiesbaden, Germany, as Deputy Chief of Staff for Operations, and later became Chief of Staff. In July 1958, Holzapple again was assigned to Headquarters U.S. Air Force, this time as Deputy Director for Operational Forces with Office of the Deputy Chief of Staff for Operations. He was assigned to the Air Research and Development Command at Wright-Patterson AFB, OH, in August 1959 as Assistant Deputy Commander for Weapons Systems Management and, in July 1960, he became Commander of Wright Air Development Division. He was reassigned in July 1961 to Headquarters U.S. Air Force as Assistant Deputy Chief of Staff for Systems and Logistics. In May 1964 he became director of the Weapon Systems Evaluation Group, Office of the Director of Defense Research and Engineering, Department of Defense. In September 1966 he returned to Headquarters USAF as Deputy Chief of Staff for Research and Development. 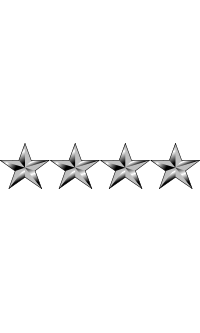 On 1 February 1969, Holzapple was promoted to the four-star rank of General and was assigned as Commander-in-Chief, U.S. Air Forces in Europe, with headquarters at Lindsey Air Station, Wiesbaden, Germany. He was also Commander of the Fourth Allied Tactical Air Force with headquarters at Ramstein Air Base, Germany. 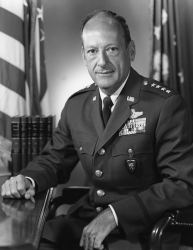 General Holzapple retired from the Air Force on 1 September 1971. He was rated as a Command Pilot. He received an honorary doctor of laws degree from Bradley University in 1958. He received an honorary doctor of laws degree from the University of Utah in 1970. Joseph Holzapple married Lois Marion Miller, the daughter of Dr. & Mrs. George Miller of Peoria, IL. The couple was married at her parents' house in Peoria on 1 March 1945. They were the parents of two daughters. The Holzapple family resided in Columbia, SC. General Joseph Randall Holzapple died on 14 November 1973. He is buried at Arlington National Cemetery in Arlington, VA.